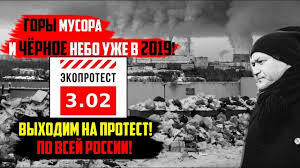 On Sunday, 3 February, Yabloko will take part in a protest against the “waste reform” and for the solution of other environmental problems throughout the country. Yabloko activists plan to participate in rallies and pickets in 32 regions of the country, in half of these actions the party became the organiser of the protest. In five regions, where the regional governments refused to give permission on rallies, activists intend to hold one-person pickets. Participants in the campaign for the protection of environment demand from the authorities to revise the extortionate tariffs for the disposal of solid waste, as well as the adoption of real state measures for the implementation of separate waste collection. In addition, each region participating in the action will add its own environmental issues to the common agenda. The Republic of Bashkortostan (a series of pickets), the city of Ufa, October Revolution Prospect by the shopping centres Mir, Semya and Iyun’. Starts at 13:00. The Republic of Tatarstan (a rally), the village of Osinovo, Sabantui field. Starts at 13:00. The Chuvash Republic (a rally), the city of Cheboksary, the ground in front of the recreation centre Khuzangay. Starts at 11:00. The Altai Territory (a series of pickets), the city of Barnaul, Square of Freedom. Starts at 14:00. The Krasnoyarsk Territory, the city of Krasnoyarsk, in front of the Community Centre Kirovsky, Kutuzov 91. Starts at 13:00. The Stavropol Territory (a rally), the city of Stavropol, the square at the intersection of Chekhov Street and Mimoz Street. The Arkhangelsk region (a rally), the city of Arkhangelsk, the square right behind the railway bridge, Dreyer 6. Starts at 12:00. The Volgograd region (a rally), the ground by the Tsaritsyn Opera House, Lenin Prospect 97. Starts at 14:30. The Vologda region (rallies), the city of Vologda, Hyde Park at Vorovskogo 66. Starts at 14.00. The city of Cherepovets, Khimikov Square. Starts at 14:00. The Voronezh region (a series of one-person pickets), the city of Voronezh, Pushkin garden at Plekhanovskaya street, 7. Starts at 12:00. Kaliningrad region (a series of one-person pickets), the city of Kaliningrad by the House of Arts, by the Lenin monument and at Leninsky Prospect, 155. Starts at 12:00. The Moscow region, the city of Sergiyev Posad, by the monument to V.M. Zagorsky, Red Army Prospect, 86. Starts at 13:00. Nizhny Novgorod region (a rally), the city of Nizhny Novgorod, Lenin Square. Starts at 14:00. The Novgorod region (a series of one-person pickets), the city of Veliky Novgorod, the ground by the shopping centre Slavyanskaya Yarmarka, Alexander Korsunov Prospect, 18. Starts at 12:00. The Novosibirsk region (one-person pickets), the city of Novosibirsk, Krasny Prospect, 57. Starts at 13:00. The Omsk region (a rally), the city of Omsk, the square in front of the Blinov community centre, Decembrists street, 91. Starts at 12:00. The Sverdlovsk region (a rally), the city of Yekaterinburg, the square of ​​Defence. Starts at 14:00. The Tambov region (a series of one-person pickets)the city of Tambov, Petrov garden, Kommunalnaya street, by the monument to the Tambov Peasant, Kronstadt Square, Lermontov garden, Lermontovskaya street, 81. Starts at 12:00. The Tyumen region (a rally), the city of Tyumen, Hyde Park in Komsomolsk Square. Starts at 13:00. Moscow (a series of one-person pickets), in the area of ​​Tverskaya street (the city centre). Posted: February 1st, 2019 under Human Rights, Protection of Environment.